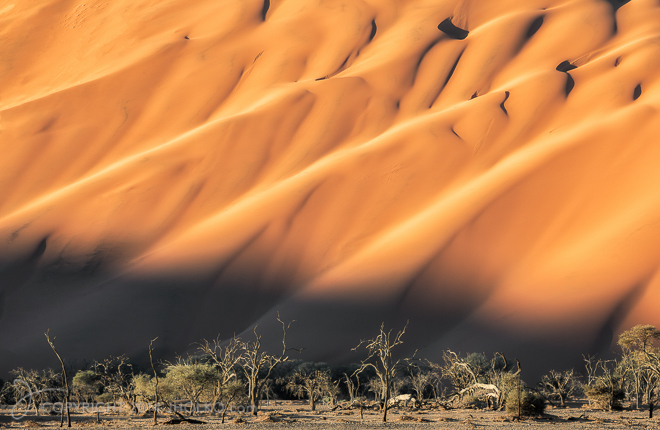 My photograph of the month for July is from the desert of Namibia in Africa. I shot this image on my recent overland Safari workshop by the roadside at Sossasvlei late in the afternoon. I recall being instantly drawn to the incredible texture and folds in the giant red sand dune juxtaposed against the fossilised dead trees. I was fortunate to also have some wonderful afternoon light and blowing sand to add atmosphere. This is one of my favourite photographs from my recent trip to Namibia. I used the Canon 200-400mm F4L IS Lens with inbuilt 1.4 Teleconverter at 1/400th of a second at ISO200 on the Canon 1DX.